I have a SQL Server database of organizations, and there are many duplicate rows. I want to run a select statement to grab all of these and the amount of dupes, but also return the ids that are associated with each organization. The reason being that there is also a separate table of users that link to these organizations, and I would like to unify them (therefore remove dupes so the users link to the same organization instead of dupe orgs). But I would like part manually so I don't screw anything up, but I would still need a statement returning the IDs of all the dupe orgs so I can go through the list of users. You can run the following query and find the duplicates with max(id) and delete those rows. But you'll have to run this query a few times. So the records with rowum> 1 will be the duplicate records in your table. ‘Partition by’ first group by the records and then serialize them by giving them serial nos. So rownum> 1 will be the duplicate records which could be deleted as such. 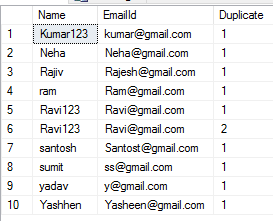 You have several way for Select duplicate rows. Not the answer you're looking for? Browse other questions tagged sql sql-server duplicates or ask your own question. 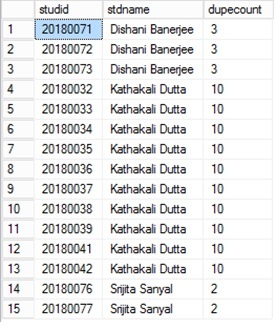 How do I find duplicate values in a table in Oracle? COUNT(*) vs. COUNT(1) vs. COUNT(pk): which is better? 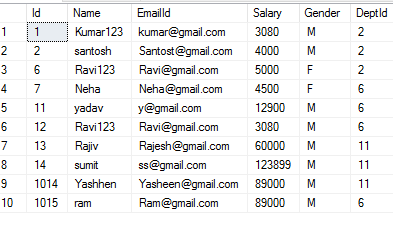 how to find duplicate records in SQL without any primary key?